So, why don’t some plans stand a snowball’s chance in the Sahara of succeeding? The order in which they are listed often dictates the order of plan development. Let’s try something new. Area noted for improvement: This one stays in front but be careful. The surveyor may not know what your real problem is. Example: A surveyor noted that 4 out of 6 charts with lab did not have the results on the chart. What the surveyor missed was two charts that were not pulled where a patient wasn’t seen for two weeks because of a scheduling flaw or the three phone calls from patients asking where their nurse was. These problems are likely related and have more to do with scheduling than lab. You are not obligated to call the surveyor or your Medicare contractor and tell them that the problem is much larger than they imagined but if you want to be effective, address scheduling. It could be that schedules are left to the field staff with little or no oversight, the schedule is not adhered to, nurses are changing their schedules without notifying anyone, etc. These are the issues that must be addressed as opposed to say, filing lab. Responsible Party: First of all, no matter what the task at hand is, the responsibility always defaults to one of two people; The Director of Nursing or The Agency Administrator. The actual person performing the task will often dictate how the task is to be done. Most of the time, it is apparent who will be responsible for the task. If the problem is billing without the appropriate OASIS assessment having been complete, the choice of responsible parties has been narrowed to a couple of people in the agency. Is the biller not performing a check? Who is reading the validation reports? Does the person currently responsible have the time for it? Is there a backup for the OASIS Submitter? Should there be one? If you really want your plan to work, have the people who will be doing the work participate in the development. Expected Date: The expected date will influence the goal and the intervention (next). For an agency quality assurance program, a 90 day goal to get 90 percent of patients weighed might be reasonable. For a state survey and payment audits, you have considerably less time. Often, the best solution takes longest so sometimes a compromise is in order. A note about state surveys: It is rare that follow-up surveys are made these days due to budget restraints but if your agency is expecting a repeat survey, your date of completion should be the very last day possible. The reason is that the surveyors will come before day 45 to be in compliance with Medicare regulations and they will only check the charts for the specific deficiencies that occur after the date the agency said they would be complete. This not only limits the documentation that is reviewed by the state but it allows more time for a new process to be integrated in an agency. Goals: In the wake of a survey, your goals are pretty cut and dry but you must make them realistic. There are no perfect agencies. By allowing a certain margin of error in some areas, the agency can set very high standards which will result in agency wide priorities in other areas. Again, each agency knows the weak links. Are missed visits really missed or is the paperwork incomplete? Personally, I am okay with missed visit documentation being present only 85% of the time. I can live with a nurse’s failure to call the MD for a blood glucose of 201 when the upper parameter is 200. Where patients really get into trouble is when medications are overlooked, given by mistake, taught incorrectly or not assessed at all. My opinion is that medication teaching and assessment needs to be a high bar set at 100 percent. So, figure out what can be done, if what can be done is enough and somehow set a reasonable bar as high as it needs to be. Interventions and Evaluation: If you consider how you will evaluate an intervention as you are determining what action should be taken, it will result in a more complete plan likely to succeed. Consider a probe edit where multiple claims were denied because there was no evidence of skilled services found in the clinical records upon review. 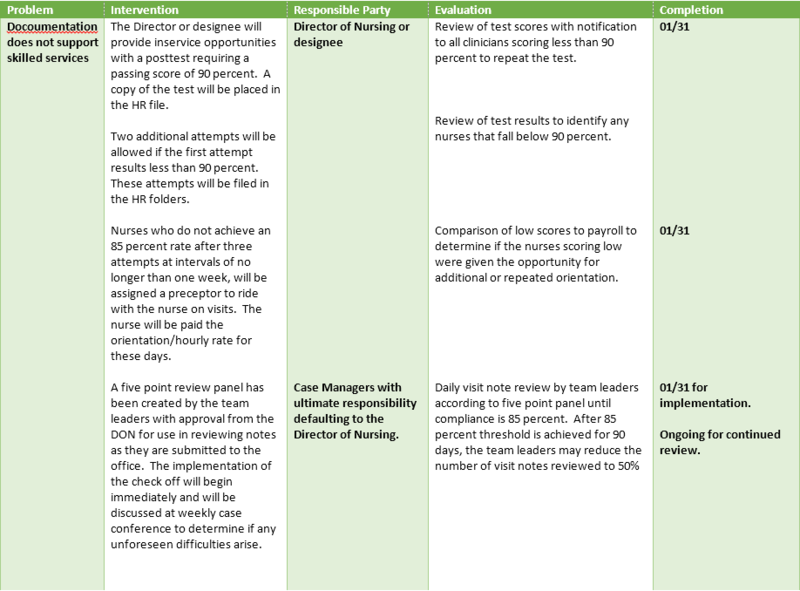 When you considered who would perform the tasks involved in correction, you identified the nurses and therapists with ultimate authority defaulting to the Director of Nursing. Because this is a probe edit that could jeopardize your agency, your deadline is tighter than ideal; thirty days. Now all that’s left is to determine what should be done. Nine times out of ten, the designated activity includes ‘inservice all staff on skilled services’. How nice. You have a dozen or so nurses out there who are unaware of what a skilled service is. How about that? By all means, re-teach what constitutes a skilled service but if you stop there you will be disappointed in the results. We are always willing and able to assist in your corrective action plan but go back to number 2 – the responsible parties. We can always write something pretty that will be accepted but the agency must implement the plan. The chances of a successful implementation are far greater if the agency employees have bought into the plan. If you do not have solid support for the plan, the next best thing is to evaluate your retirement plans because the agency will fail unless major shifts in culture are made.